Sherwood is a hamlet located east of Edmonton, AB. It is part of Strathcona county. Mostly famous for its acreage homes and farmland, Sherwood park is preferred by many as a nice community to live in outside the city. 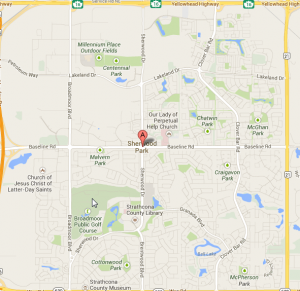 Sherwood Park is nestled south of Highway 16 and North of Highway 630, a.k.a Wye Road. At Last Minute Limousine, we provide full limos and stretch car rental service to residents of Sherwood Park. Whether you have to get to an even that is local to Sherwood Park or you need to get to the city, we are the number one choice. We are centrally located in the Edmonton city and access to your part of town is a convenient 20 minute ride. We provide to and fro service from Sherwood Park to Edmonton regardless of where the rental commences. Our fleet of limos include town car, stretch limo, SUV and luxury sedans. All our vehicles are well taken care off and are of the latest models with all the accessories to ensure you have a pleasant an memorable rental experience with us. Our drivers are well trained professionals who know their way around not just Edmonton city, but also Sherwood Park.